If you’re looking for a way to experience Charleston Harbor, book a private boat tour with Therapy Fishing. On our Charleston Harbor boat tour, you’ll be treated to stunning views of the coastline and a unique perspective of Charleston’s historic sites, wildlife, and architecture. 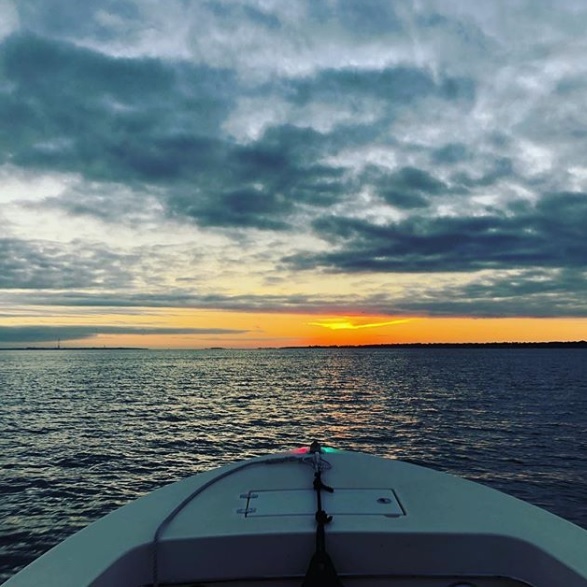 Our Charleston Harbor boat tour offers the perfect opportunity for a midday or evening cruise in one of the most beautiful sites on the Eastern seaboard. On Therapy Fishing’s 23’ center console boat, up to six people can enjoy all the sights of the harbor, guided by Captain Adam. Adam knows the Charleston area well, including exactly where to take you on your tour so you can experience all that the harbor has to offer. Charleston is home to Fort Sumter, the site of the very first battle of the Civil War. Get impressive views of the fort from up-close on the water. A cruise around this area will take you back in time to Charleston’s tense days as a flashpoint for the Civil War in the mid 19th century. You’ll also see the impressive USS Yorktown, not to mention unique views of Charleston’s famed Historic District from the water! In addition to historic sites and man-made attractions, there’s plenty of natural beauty to take in as well. Dolphins frequent the area, and we can take you to where they are most often sighted. There are many other kinds of fish and birds to spot as well! A private Charleston Harbor cruise will treat you to views of classic Southern architecture. Cruise along the Charleston Battery and enjoy views of the area’s most impressive and historic homes. Some of these opulent mansions are over 20,000 square feet and date back to the Civil War Era! You may also cruise under and around the Arthur Ravenel Jr. Bridge, the impressive cable-stayed bridge that connects Charleston and Mount Pleasant. Unlike many other boat tours, which are set on fixed schedules, our itineraries can be customized to meet your exact needs. If you have particular sights or areas you’d like to see, we can help you get there. Let us know what you’re looking for, and we can accommodate to make your cruise a memorable one. Captain Adam can provide you with a relaxing, informative, and beautiful tour around the Charleston Harbor. You and up to five guests can enjoy historic sites, wildlife, and charming Southern architecture—or you can craft a custom itinerary to make the experience truly your own. And, of course, we offer plenty of great fishing trips too! Therapy Fishing looks forward to showing off the beauty of Charleston’s waterways. Book a private Charleston Harbor boat tour today!